Tax Cuts and American Jobs: Where will the Corporations Put Their Tax Savings? Imagine all enterprise functions automated by software and performed through a single point of access, which happens to be a virtual agent with cognitive capabilities. You can stop imagining and start thinking about the repercussions, because this is much closer than you may think. I have not met a single CEO, from Deutsche Bank to JP Morgan, who said to me: ‘ok, this will increase our productivity by a huge amount, but it’s going to have social impact — wait, let’s think about it’. George Anadiotis, Who’s automating the enterprise? Meet Amelia and the future of work, ZDNet, November 8, 2017. Accessed November 8, 2017. In commenting on the proposed tax cuts for businesses in the U.S., numerous business analysts have pointed out that many global corporations have lots of cash on hand (much of it off shore) and that borrowing costs are very low. If there were investment opportunities in the U.S. that promised a decent return, those corporations would be using that cash and borrowing capital. Profits have been rising largely via cost cutting and swallowing up rivals rather than through the growing incomes of customers and clients. Can workers in the U.S. really expect U.S. corporations to change investment strategies solely because their cash holdings overflow even more? Even if the tax cuts went to U.S. consumers, the impact on investment strategies would be minimal – unless Trump succeeds in creating a U.S. market protected from imported consumer goods. Tax cuts and automation are not the private domain of U.S. economic policy; Germany and China and all the other players can be expected to respond with their own investment incentives, so increased U.S. consumer spending would almost certainly distribute new investment across the world economy, resulting in more automation, more global displacement of working people, more profits, more wealth inequality, and more damage to the natural environment. It is worth noting one more thing from the article cited above. Business operations can now be automated very quickly, much more quickly than underfunded retraining programs can retrain workers and return them to work. This mismatch between the speed of business innovation and the speed of government responses to worker displacement and income losses will only get worse. Posted on November 8, 2017 by Jim LundayPosted in Automation and Work, Global Workforce Trends, U.S. Employment PolicyTagged Automation, Global Economy, Job Growth. Making matters worse, the return on investment in education is falling, because the economy is growing slowly and changing rapidly, making it difficult for some graduates to secure employment that takes advantage of their knowledge and skills. Universities are often slow to adapt their curricula to the economy’s needs, while new technologies and business models are exacerbating the winner-take-all phenomenon. Mohamed A. El-Erian, America’s Education Bubble, Project Syndicate, November 9 2015. Accessed November 9, 2015. 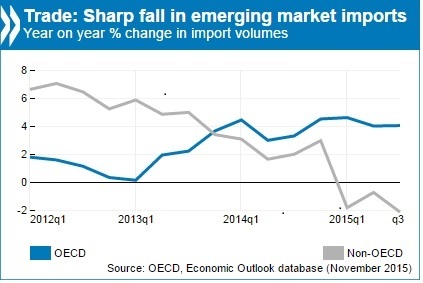 Emerging market slowdown and drop in trade clouding global outlook, Organization for Economic Cooperation and Development. Accessed November 9, 2015. The demonstration is significant for two reasons. First, the tasks the robot is being asked to perform aren’t rigidly defined. Instead the robot needs to identify and adapt to a complex situation involving several variables. … But that technology migration is underway, and it will change the way products are manufactured and delivered. … On the robotics front, that means we’re going to see more flexible systems that can switch between tasks on the fly. Greg Nichols, Why a fruit sorting robot will disrupt industrial automation Adaptable, smart, and cheap. Welcome to the future of automation, ZDNet, November 7, 2015. Accessed November 9, 2015. Without human advisers — people are the biggest expense at any securities firm — the new ventures can charge annual fees of 0.5 percent of assets under management or less. That undercuts full-service brokers, which typically charge annual fees of at least 1 percent. Hugh Son, A Money-Managing Robot Is About to Join BofA’s Thundering Herd, Bloomberg Business, November 6, 2015. Accessed November 9, 2015. The old economic narrative that each nation has it’s economic destiny in its own hands is dead. The old economic narrative that a rising tide lifts all boats is dead. The old economic narrative that new jobs in new industries are created faster than automation displaces workers in existing industries is also dead. What this means is that the institutional and policy logics of job creation that served Americans and other western peoples well though the middle of the 20th century are dead. We must replace those outdated logics with new ones that fit the realities of an Inclusive World Economy in which all destinies are tied together and rights to income can no longer be tied almost exclusively to having a wealth producing job. Posted on November 9, 2015 November 9, 2015 by Jim LundayPosted in Global Workforce Trends, Inclusive World Economy, U.S. Employment PolicyTagged Automation, Degradation of Work, Global Job and Income Growth. But salaries higher than those offered last year might not be part of the deal. … Gardner said about a third of employers surveyed plan to raise salaries this year, compared with 60 percent to 70 percent before the 2008 recession. Curt Smith, Job market better for recent grads, MSU survey finds, Lansing State Journal, October 9, 2015. Accessed October 10, 2015. By one dismal measure, America is joining the likes of Third World countries. … The number of U.S. residents who are struggling to survive on just $2 a day has more than doubled since 1996, placing 1.5 million households and 3 million children in this desperate economic situation. That’s according to “$2.00 a Day: Living on Almost Nothing in America,” a book from publisher Houghton Mifflin Harcourt that will be released on Sept. 1. Aimee Picchi, The surging ranks of America’s ultrapoor, CBS News, September 1, 2015. Accessed October 10, 2015. There could be between 10,000 and 13,000 victims of slavery in the UK, higher than previous figures, analysis for the Home Office suggests. … Modern slavery victims are said to include women forced into prostitution, “imprisoned” domestic staff and workers in fields, factories and fishing boats. Slavery levels in UK ‘higher than thought’, BBC News, November 29, 2014. Accessed October 10, 2015. Erik Brynjolfsson has a dream of the future. Or perhaps more accurately, a nightmare. … A vision of a world where computers entrench the power of a wealthy elite and push the majority into poverty. … Brynjolfsson is an economist at the Massachusetts Institute of Technology (MIT) and co-author of The Second Machine Age, a book that asks what jobs will be left once software has perfected the art of driving cars, translating speech and other tasks once considered the domain of humans. Nick Heath, Why AI could destroy more jobs than it creates, and how to save them, TechRepublic, No Date. Accessed October 10, 2015. In the distant past, when the worth of a human worker was primarily her/his calorie power (for moving, pushing, pulling, lifting, twisting, and turning materials and equipment used in the production and distribution of wealth), only a very few workers were engaged in highly skilled work and decision-making. In most of the world of work, one worker could easily replace another (according to one story, a mule was more valuable to a mine owner than a man). Slavery was cost effective, immigrant and seasonal workers and starvation wages were the norm. In the nearer past, workers in affluent nations had gained substantial economic power as business owners increasingly needed human workers not only as a source of energy but also as a repository of learned production skills (e.g., skill at soldering a resister to a circuit board without leaving an electrical arc point), and as managers, problem solvers (the intelligence to figure out why the assembly line shut down or whether a particular article contained information relevant to a lawsuit) and planners. The nearer past was also a time when much of the world was still not incorporated into nation-states and markets, so capturing more and more of the world’s people as consumers required more and more production and distribution facilities and equipment, which required more and more highly skilled workers and managers. All of that is going fast. Fossil fuels and solar power (in all its forms) replace human muscle power. Robotic skills replace human skills. AI software and massive computing power combine to make better, faster and more consistent (unbiased by considerations of kin, ethnicity, race, gender, looks, etc.) decisions than human decision-makers. What is left to give the mere mortal economic importance? Not much. AI and robotics, in conduction with fossil fuels and solar energy, have dramatically reduced and will continue to reduce the value of working people for the world’s business owners and managers. In the context of global competition, American and European workers are much too costly given the savings achievable through combining AI, robots, and low wage, unskilled workers in the world’s factories and offices. Even the most honorable of business owners and managers must succumb to the competitive pressures – shedding higher wage, skilled workers and escaping regulations and taxes now devoted to protecting employment rights. Wages, benefits, and employment protections must continue to fall in the wealthiest nations and the best of businesses. Enslavement, indentured servitude, unpaid family labor, and self-exploitation are labor acquisition strategies as old as humanity and there is no reason to believe the less honorable among the world’s owners and managers will not directly and indirectly take advantage of these strategies. Studies are already finding that these things are on the rise. There is no reason to believe the business owners and managers who are fair to their own workers will stop closing their eyes to the exploitation and coercion of working people practiced by the other owners and managers with whom they do business. Relying on the cheapest sources of components and raw materials must be part of the competitive strategy of every business owner and manager, including the most honorable. Posted on October 10, 2015 October 12, 2015 by Jim LundayPosted in Automation and Work, Coerced Labor, Employment, Future of Work, Labor ExploitationTagged Automation, Coerced Labor, Degradation of Work, Employment. Our kids face three big adjustments. First, to be in the middle class, they will need to be constantly improving their skills over their lifetime. Second, to do that, they will need a lot more self-motivation. … And third, countries that thrive the most will be the H.I.E.’s — the high imagination-enabling countries — that attract and enable talent to be constantly spinning off new ideas and start-ups, the source of most new good jobs. Thomas Friedman, Can’t We Do Better?, New York Times, December 7, 2013. Tom Friedman is almost always worth reading, but he has yet to acknowledge a societal development that is one of the most consequential for the world’s working families – the transformation of the role that work plays day in and day out in distributing the world economy’s newly created wealth. Ironically, Friedman identifies the very forces that are undoing the role of work in distributing newly produced wealth, but fails to follow through. He takes us right to the door through which he could walk us to the real solutions to growing poverty and inequality. He then turns away and offers up the same old failed conventional wisdom. Friedman and so many others define the problem of low wage jobs and growing inequality as due to the inadequacies of workers (low skills, outdated skills, lack of drive). They fail to seriously consider the possibility that the world of work is changing in such fundamental ways that no feasible amount of improvement in the skill levels of working people or change in their approaches to getting and keeping jobs can reverse the trend toward lower wages and greater poverty and inequality. As Friedman rightly notes, global integration and advancing productive technologies have great consequences for working families and societies, but not because they are creating demand for highly skilled workers and destroying demand for low skilled workers. The core systemic change is that those forces are producing an enormous and growing surplus of labor, both skilled and unskilled. The role of machine energy in the production of the world’s goods and services has advanced to such a large proportion of the combination of human energy and machine energy that the available human energy far exceeds the demand for human energy. Even human thinking energy is being displaced by machine energy. The trend shows up in the long term decline in the proportion of the world’s population that is employed. Friedman and others apparently believe that this trend won’t eventually bring us to a point in time when more than half the world’s people are effectively outside the world of work. How then will we distribute the world economy’s newly created wealth day after day? The era in which employment could be the primary way in which a person could legitimately claim a fair share of the world economy’s income is nearly over. Yet Friedman and other experts still have not asked the question in public of what will give a person a right to a fair share of income in this increasingly jobless world. The world’s people desperately need a new kind of right to income, and until we invent that right, inequality will keep getting worse and more of the world’s people, including Americans, will be shoved into lives of destitution, begging, scavenging, and violence. Posted on December 8, 2013 December 8, 2013 by Jim LundayPosted in Global Workforce Trends, Inequality, Technology and Global Productivity, U.S. Workforce Development Policy, U.S. Workforce TrendsTagged Automation, Global Job and Income Growth, Unemployment. How Many Professional Workers Can Ten Thousand Super Computers Supervise? “China has made its first supercomputer based on Chinese microprocessor chips, an advance that surprised high-performance computing specialists in the United States. It is said that at some point accumulating quantitative change becomes a qualitative change — a spring rain lasting forty days and forty nights becomes something other than a rainy spring! Has the world had its forty days and forty nights of global technological change? – if not, it has surely had at least thirty days and the pace of technological change is accelerating. Imagine a world in which a hundred million people (working below the U.S. minimum wage and supervised by Humanoid and similar programs) are writing software code intended to displace professional workers in law, medicine, teaching, business management, consulting, and government. The core question for the 21st century is this: how will the world’s nations create socially legitimate entitlements to income in an era when only a minority of the world’s working-age people can obtain income through work and most of those who do work are paid less than a living wage? Posted on November 9, 2011 November 9, 2011 by Jim LundayPosted in Global Workforce TrendsTagged Automation, Employment, Technology. “Capital goods orders rose a robust 4.2 percent in August from July. Core capital goods orders — nondefense bookings for items such as industrial machinery, power transmission equipment and computers, but excluding the auto and aircraft sectors — rose 1.1 percent. From the standpoint of business leaders, the impact of investments in capital goods on employment opportunities is only a side effect. If the investments contribute to job growth, they are happy to get the positive public relations bump. If they undercut job growth, well, that’s just unavoidable collateral damage. Yes, a burst of investments in capital goods can generate employment, but only in the short term. Downstream, as those new computers, manufacturing robots, and assorted other high end technologies go live in workplaces, jobs will bleed out, more than offsetting short term job gains. We now live in a world in which an accelerating global shift in the mix of humans and machines engaged in the production of goods and services is squeezing the life out of employment and income growth. The pace at which machine energy is replacing human energy in the workplace is accelerating. Machine energy has already replaced enormous amounts of human energy in agriculture, mining and manufacturing. Today machine energy is increasingly replacing human energy used in thinking (evaluation and decision-making activities) in more and more fields of work, including professional fields. Public policy cannot and should not stop innovation and the growing use of machines to supplement and replace humans in the workplace. (Indeed, workers in many types of work are still exposed to dangers that can best be reduced by using more machines.) But, use of tax write offs to encourage even faster displacement of workers by machines when done in the absence of a comprehensive policy approach to creating wealth and equitably distributing that wealth is extraordinarily wrongheaded. Such unlinked use of tax write offs can only exacerbate the damage already being done to jobs and income in the U.S. This kind of unlinked use of tax write offs is not just a U.S. practice. Many of the world’s nations take the same approach to increasing market shares in very competitive global investment markets. These nation by nation tax write off practices aggregate into a global economic force that increases wealth production and increases corporate profits, but also relentlessly destroys jobs and the incomes of families that depend on those jobs. As of now the world does not have a comprehensive policy approach to managing the growth of the world economy. More to the point, the world does not have global institutions with the power to coordinate economic policy-making across the world’s nations on behalf of the world’s people. Thus, the ongoing global transition to more and more use of machines in place of people is both unmanaged and unmanageable. The largely destructive aspects of this transition cannot yet be addressed and rectified. In this context, the Obama administration’s 100 percent depreciation of new equipment can only become a 100 percent disaster for working families in the U.S. and in the rest of the world. Posted on September 29, 2011 by Jim LundayPosted in Global Workforce Trends, U.S. Workforce TrendsTagged Automation, Employment Policy, Technology. So, how are corporations using their tax breaks? Answer A. To actually hire more of the unemployed workers whose neighbors are paying for the tax breaks? Answer B. To replace more U.S. workers with machines and hire more workers in the emerging markets around the world that all are competing for? This question should be making a lot of policy makers a bit nervous! Motoko Rich, Encouraging Numbers, at First Glance, New York Times, May 13, 2011 (May 14 print edition). Christine Hauser, Recovery Seen in Rising Use of Credit Cards, New York Times, May 13, 2011 (May 14 print edition). Posted on July 13, 2011 July 15, 2011 by Jim LundayPosted in Global Workforce Trends, U.S. Workforce TrendsTagged Automation, Employment Policy, Investment Trends, Job Growth.